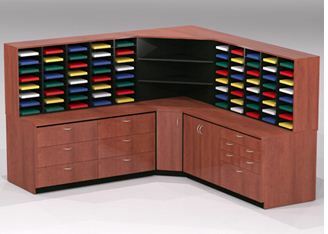 Mail room facilities need furniture that will meet their constantly changing needs. As mail volume and personnel fluctuate, your mailroom furniture will have to be adjusted too, which is why mailroom sorters, tables, and cabinets need to be modular. 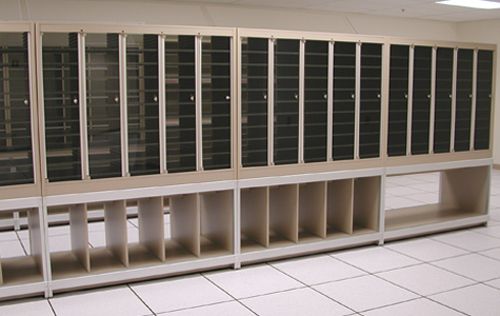 Modular mailroom furniture offers a flexible and cost-effective active document storage solution when compared to millwork construction. 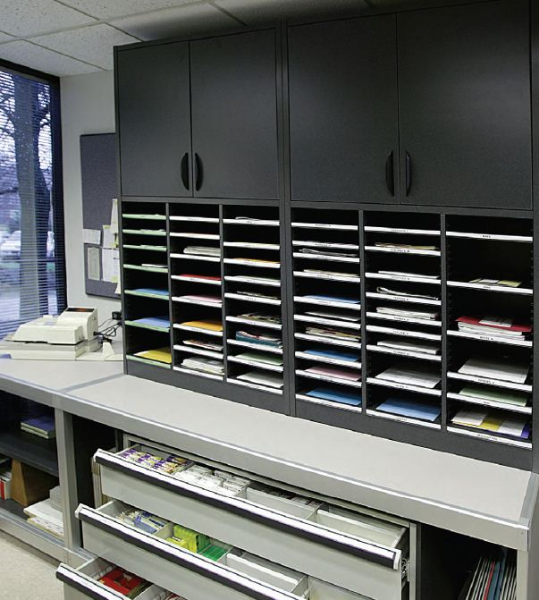 We have modular mailroom furniture that will make sure mail and documents efficiently flow through your organization and safely reach their final destination. 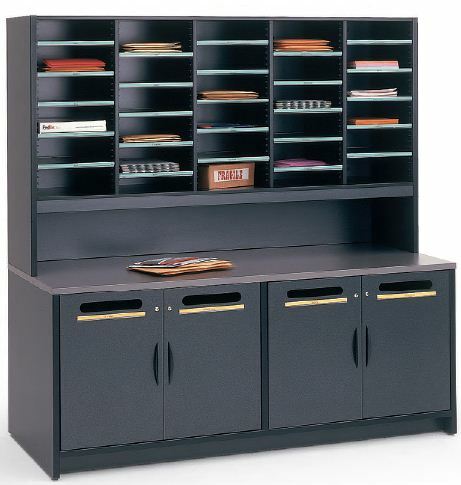 Our mailroom furniture is designed to make your mail room facility operate at its best. 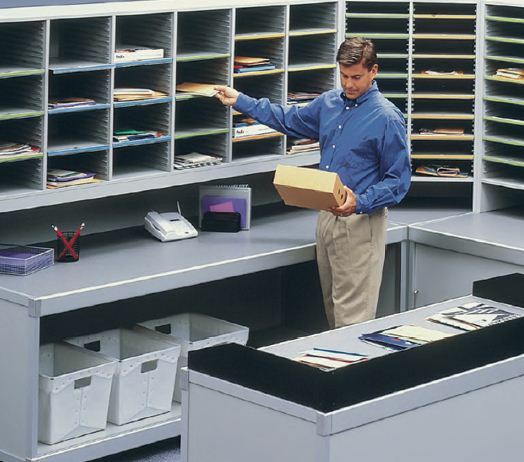 We offer mailroom sorters and tables that come in a wide range of heights, widths, and depths that are easily adjustable. 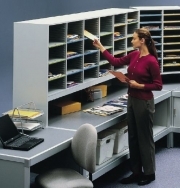 Your employees will have ergonomic access to mail and documents because our furniture can accommodate standing or sitting heights. They also won’t have to worry about injuries to their hands because there are no sharp metal shelf edges. 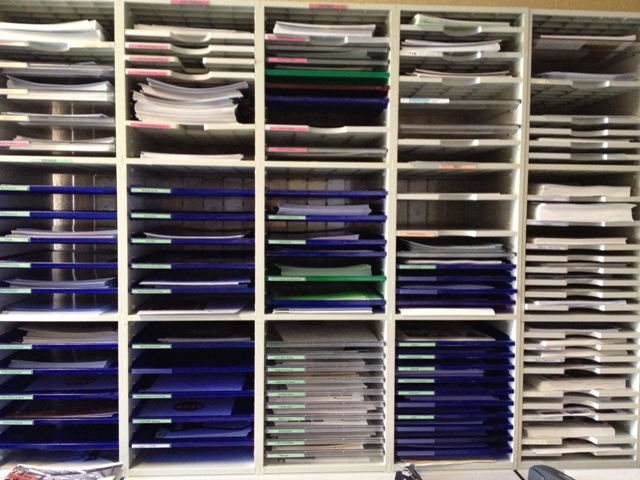 We also carry a wide range of accessories like shelves, labels, drawers, and doors to help increase efficiency and security. 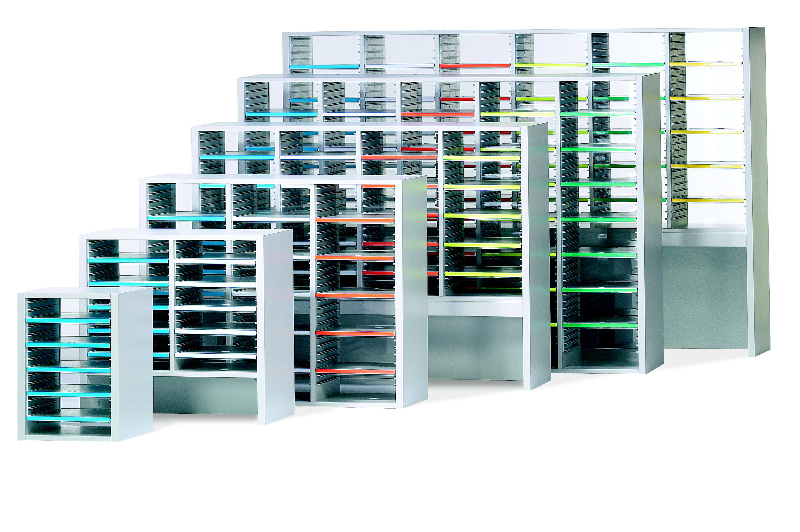 Our mailroom furniture also comes in many different standard colors to help employees with color recognition while sorting and to match your office décor. 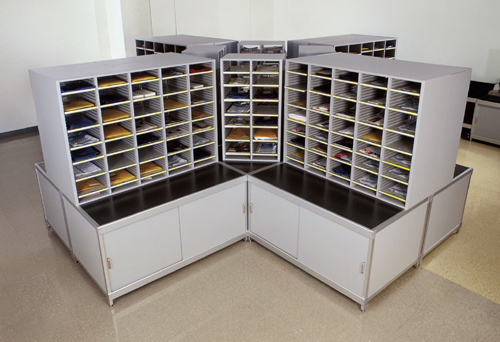 Freestanding Sorters: Freestanding and stand alone mailroom sorters offer exceptional adjustability and labeling features that will make the most of your mail room facility. 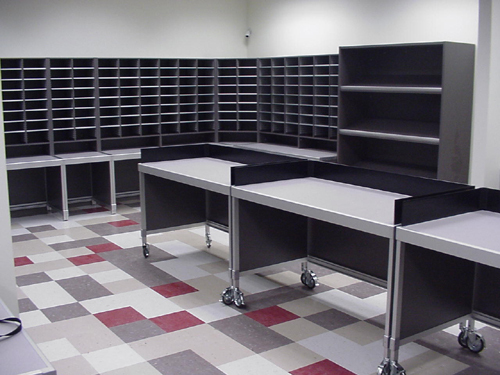 Mail Room Tables: Mailroom sorting tables and cabinets come in numerous styles and heights to assist mail room personnel. 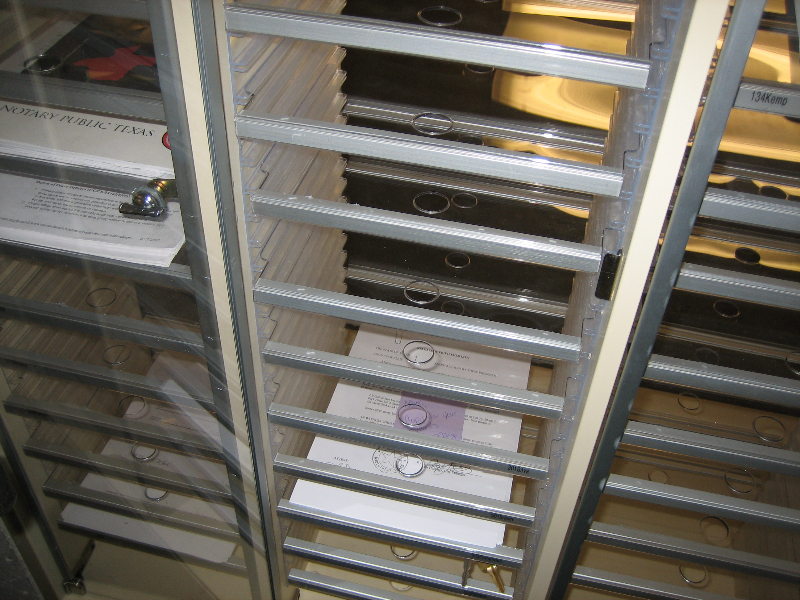 Pass Through Sorters: Pass through mail slots are mounted into the office walls, which makes mail distribution fast and easy. Mail Room Carts: Mail carts come with ergonomic handles and over-sized wheels to help employees easily navigate around any obstacles.